The Mountain Training Hill & Moorland Leader Training (H&MLT) is a 3-day course. 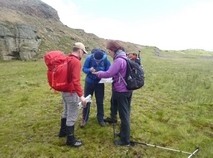 The Mountain Training Hill & Moorland Leader Assessment (H&MLA) is also a 3-day course. The Hill and Moorland Leader award offers the opportunity to gain experience and demonstrate technical competence in leading groups on hill walks in areas of the UK and Ireland that fall within the technical definition outlined below. Such areas may often be subject to hostile weather conditions and require an element of self-sufficiency and this is reflected in the syllabus of this scheme.